Squee! I just got copies from UK Simon & Schuster of the British version of Girls Who Rocked the World. Their cover is very, very cool. And I got to co-write an article about it in a British magazine, Female First. So today I was on Portland TV with four of the girl co-authors who wrote essays in More Girls Who Rocked the World. I've been on TV a few times before, but it was their first time. Very exciting stuff! We had a blast eating free candy in green room, doing make-up under the dressing room lights, watching the show from back stage... Having the girls there with me-- with their girlish enthusiasm and happiness-- changed the whole experience from entirely stressful to totally awesome! Girls can do that. And they completely stole the show! Girls rock! In the green room... under the dressing room lights... me and the girls on stage getting interviewed. Girls Rock! You know it, I know it. Come celebrate that fact, and discover the amazing stories of girls throughout history, around the world, who have made their mark before the age of 20. 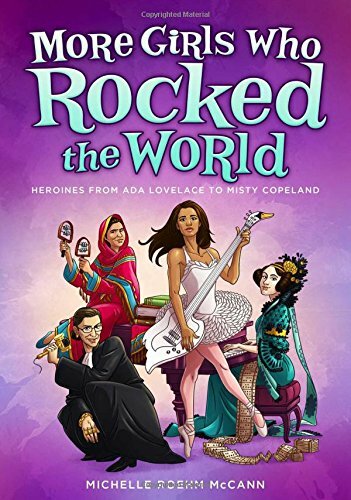 Short biographies of 45 girls: from historic heroines like Eleanor Roosevelt and Josephine Baker, to today's world-rocking ladies like Beyonce and Malala. You will also meet 13 Portland girls who contributed inspiring essays to the book. Nothing is more inspiring to real girls than meeting real girl authors just like them. Last but not least, there will be a Girls Who Rocked Costume Contest--come dressed as your favorite heroine and win a prize!